Cats catch ear mites from other cats. Any dog or cat can catch ear mites, but they are more common in kittens and cats that live outdoors. Veterinary treatment is necessary to get rid of the mites. Untreated, your cat may develop a bacterial or fungal infection as a complication of the mites. Take your new cat to the veterinary. It makes sense to have any new pet looked at by a vet before bringing him into your home, where he may infect your other pets with some unknown illness. If you see signs of ear mites, however, it is doubly important to make sure your new cat sees the vet first. Signs of ear mites include head shaking, hair loss, excessive rubbing and scratching of the ears, bad odor coming from the ears and an ear discharge that resembles coffee grounds. Talk to your vet about how long your new cat should be separated from the other pets. There are one-time use treatments that, along with a thorough ear cleaning, should remove the ear mites in all life stages immediately. Other treatments may require 10 to 14 days to clear up the ear mites completely. Bring your cat home and set him up in a separate room from the rest of your pets. This is a good idea regardless of how healthy your new cat is, as it gives your pets time to get used to each other's smells and sounds without allowing them to fight. Make sure your new cat has his own food and water dish, bedding material and litter box so you don't risk infecting your other pets. Even if your cat received the one-time treatment, keep him separated for a few days to ensure the treatment was effective. 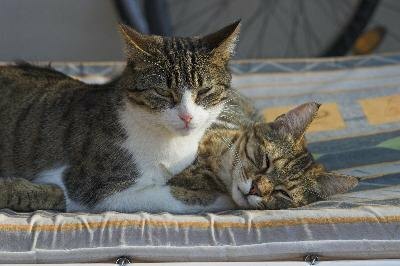 You cannot get ear mites through contact with an infected cat; however, some people do develop a rash from contact with the mites. Over-the-counter ear mite treatments are less effective than prescription-strength varieties and do not kill all life stages of the mite. This means reapplication and a longer separation period are required.